Can’t We Just Get It Printed? 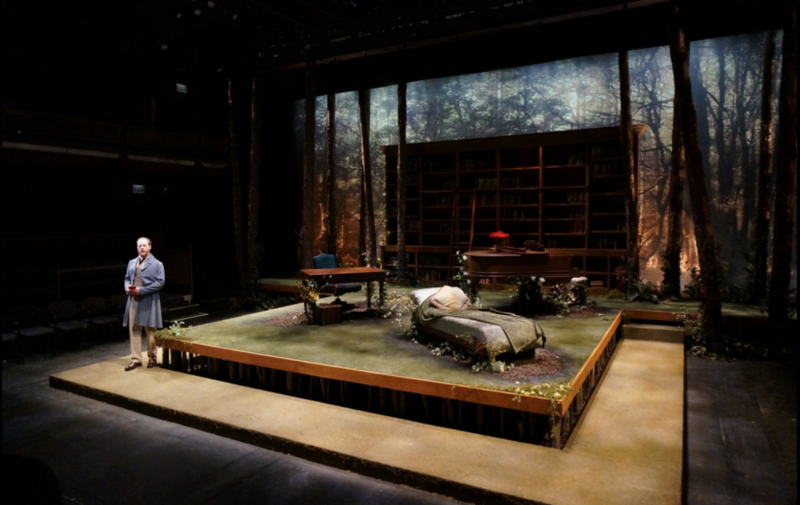 One of the most complicated relationships a Scenic Artist will have in these modern days is their relationship with a digitally printed drop. 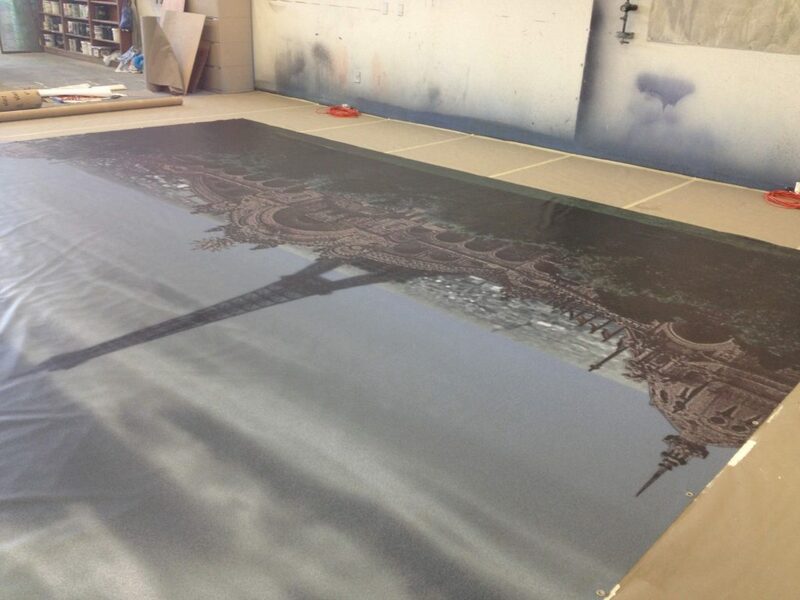 Love it or hate it, digitally printed images are becoming part of a Scenic Artist’s tool kit. The cost of large scale printing is rapidly decreasing, and over the past few seasons I’ve had more and more conversations about backdrops that end in “Can we just get it printed?” While I was initially annoyed and angry about the prospect of turning over an entire project to a machine, my view over the years has softened – slightly- and I’ve learned to use digital printing to my advantage. “In the Garden” Designed by Collette Pollard. When the decision is made to print rather than paint a drop, it becomes someone’s job to get the “design” to the printer. That could be the Tech Director, Production Manager or in some cases, the Scenic Artist. There are numerous factors that go into making a printed drop a success. The first of those is the image file that you have to work from. Ideally, you’re working with a designer who is skilled in Photoshop and can provide you with a high resolution image from the outset. In my experience, there are two standards that most printing companies require these images to be. If the final output is 120” or smaller, the image needs to be set up in a 1:1 scale (actual size) and have a resolution of 75dpi (dots per inch) or higher. If the final output is larger than 120” the image needs to be formatted in a 1:10 (1”=1’0”) scale with a resolution of 300dpi or higher. Most companies prefer images be sent to them as CMYK PDFs, as to avoid dealing with the complications of a Photoshop file. USA Image, a local Louisville company, has put out a straightforward guide to file specifications that can be found here. Proper resolution is incredibly important because unfortunately, if an image doesn’t have enough DPI from the get-go, the final image will be pixelated and there’s not much anyone can do to make a blurry image clearer. I’ve always found that to help ease the headache of finding or creating usable artwork, send file specifications to the designer the moment a printed drop comes into the conversation . 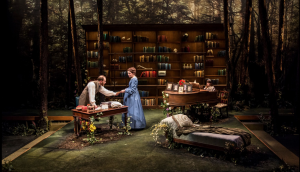 The first printed backdrop I ever worked on was for Lookingglass Theatre’s production of In The Garden. I was fortunate enough to be working with Collette Pollard, who provided us with a beautiful, high-resolution image of a sunlit forest that I was able to send directly to the printers. Often, as was the case here, printing companies can add grommets to the top of the drop and sew in a pipe pocket along the bottom, alleviating some of the work on the shop. Even though most printed drops end up being significantly stiffer than fabric ones, they’re still prone to wrinkles without pipe or chain at the bottom to weigh them down. Despite this being an added cost to the drop, I’ve found that it’s a worthwhile expense since sewing such large pieces of material is often quite a hassle, and no different than ordering a muslin drop from a company either. Another hurdle with printed backdrops is choosing a material. 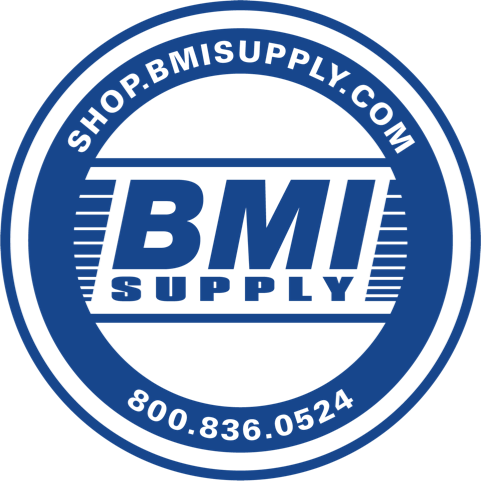 While muslin or other cotton fabrics are the ideal choice, they are often cost prohibitive. 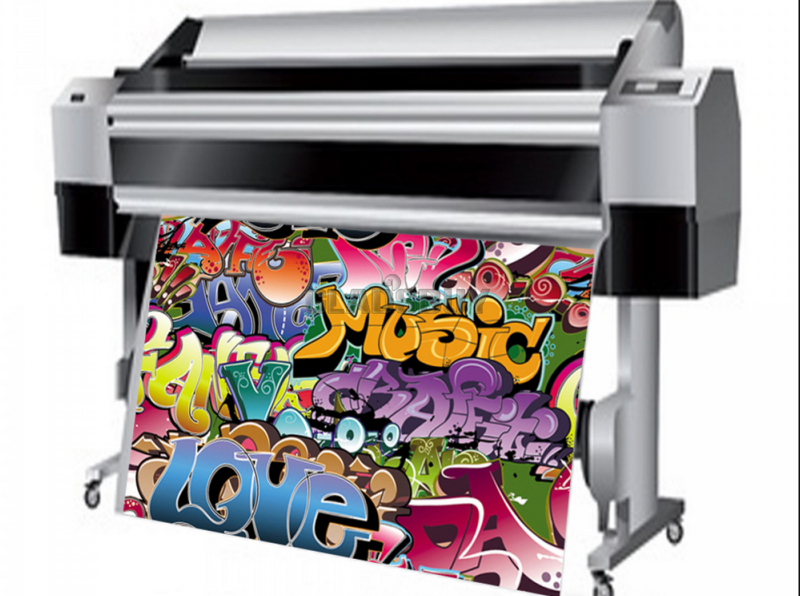 Vinyl is commonly the least expensive option, and while most printing companies offer a large format “matte” vinyl, it frequently is not flat enough to assuage concerns about glare from lighting designers. After many tests, the best solution I’ve found is to coat the entire drop with Rosco Acrylic Flat Sealer. Once I have the printed piece in my shop, I’ll lay it out on my deck, similarly to how I would a muslin drop. Since shrinkage isn’t a concern with plastic, I’ve found you only need to staple every few feet – just enough to tack the piece down to the floor. Using a brand new 3/8” nap roller, I’ll roll on an even coat of sealer and let it cure overnight. Occasionally I have done a second coat of sealer, but only in cases where the initial coat didn’t flatten the sheen enough. One of the things I like about printed drops is that I’m able to complete what would usually be a complicated, time consuming project in a fraction of the time. For A Comedy of Tenors, the opening show of Cleveland Play House’s 100th season, Scenic Designer Charlie Corcoran designed a a translucency of the Parisian skyline. The scale of the rest of the scenery was so massive that the Technical Director and I eventually decided to print the image and alter it to fit our needs. We worked with Jakprints, a national company out of Cleveland, to find a seamless semi-transparent vinyl. 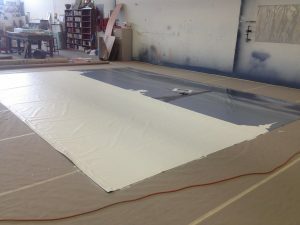 Finding a seamless plastic that came in the width we needed was important because, as with a regular muslin translucency, any seams would be immediately apparent once the piece was back-lit. The backside of the Comedy of Tenors Parisian skyline translucency, after being partially opaqued. After we had coated the front with flat sealer, my crew and I flipped the drop over and used four coats of Glidden’s Gripper to opaque out the buildings. Luckily for us, the image had been printed on both sides of the drop (not usually the case), so we didn’t have to worry about transferring the shapes of the buildings to the back of the drop before flipping it over. In instances where I haven’t been so lucky, I was able to transfer image to the backside by rigging it up in a darkened space and blasting the front of it with light, so the shapes were visible from the back. On some occasions I’ve found that even though the photorealistic images we print are beautiful up close, they end up looking a little flat from the house. Once the Comedy of Tenors drop was hung and seen under lighting, the image just wasn’t as dimensional as we had hoped it would be. One benefit of having already coated the front of the drop in acrylic sealer is that it created a usable surface for us to paint on. We went back in and added highlights and shadows to the front of the main building, as well as some sponge work to the surrounding foliage to create the depth that had gotten lost in the photo. It was a quick fix and ended up making a huge difference to how the backdrop looked. Sometimes I see a beautiful backdrop that I’d love to paint and get disappointed when I find out that the design or time necessitates it being printed. Despite my initial feeling, I’ve begun to look at printed backdrops as allowing me to put my focus and time into making the rest of the scenery look that much better. During the Humana Festival at Actors Theatre of Louisville, we’re often pressed for time to complete even the 3D scenery we do have, let alone painting a full stage drop, and it’s in those moments where I’m incredibly grateful that the technology exists to “just get it printed”. 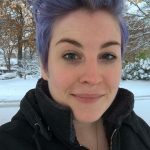 Racheal Claxton is the Charge Artist at Actors Theatre of Lousiveille, more of her work can be seen at here at her website. Also don’t forget to check out her other Scenic Route article about Creating a Faux Grass Effect! Do you have color calibration issues? Have approval samples printed? I’ve always gotten color samples printed, and have yet to have any issues with color calibration. Usually I’ve found that companies will give me free samples of an off-cut they have which I use more to judge just how “flat” a material actually is, but if I want a sample of my specific image then that’s something I have to pay for.